There are a lot of recipes for chocolate cake out there, and believe me I’ve tried quite a few. But I always come back to the Ultimate Chocolate Fudge Bundt Cake. It is hands-down, tried and tested, the best chocolate cake I’ve ever made! 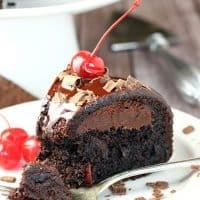 In fact, I’ve been making this rich, decadent chocolate bundt cake for over 20 years and in all that time, I’ve never found another recipe that comes close to being as rich, dense and decadent. It’s my go-to chocolate cake recipe and I’ve never served anywhere that it didn’t receive rave reviews. I’m not a big fan of regular old cake from a box mix, but this has enough additions to transform it into a dense, moist, gooey cake. I rarely even frost it, although it’s fabulous drizzled with this homemade chocolate ganache, or topped with some homemade whipped cream and fresh berries. Rather than greasing and flouring my bundt pan, I just use a generous coating of Baker’s Joy. And I really like to use mini chocolate chips in this recipe if I have them handy. They almost melt right into the cake! Everyone needs a great chocolate cake like this in their recipe box. 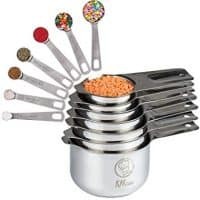 It’s perfect for almost any occasion, including special occasions. Just be prepared to be asked for the recipe whenever you serve it! Your friends will thank you! 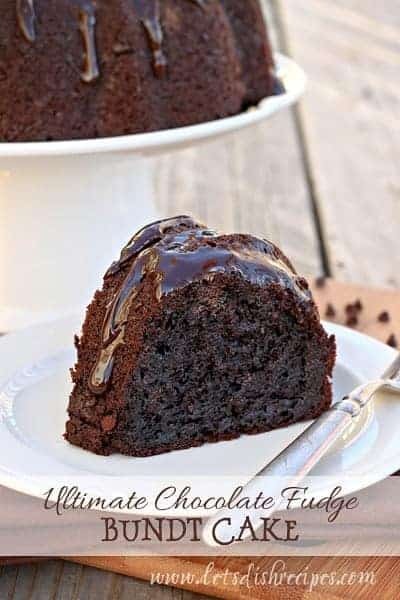 Be sure to save this Ultimate Chocolate Fudge Bundt Cake recipe to your favorite Pinterest board for later. My family thinks this is the best cake ever. My daughter-in-law is a registered dietitian and she loves it. My son is having a surprise party for her tomorrow…..and he asked me to bring two of the cakes to serve to the guests after lunch. 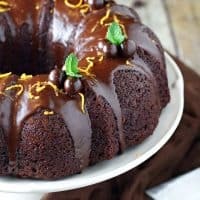 The flavors of orange and chocolate are the perfect compliment to each other in this rich, moist bundt cake. Finished off with a chocolate glaze, this cake is the perfect dessert for any special occasion. 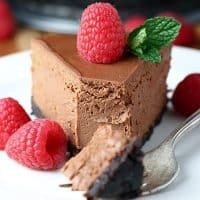 Rich, decadent chocolate cheesecake with a chocolate crumb crust, cooked to perfection in your Instant Pot. Served warm and topped with vanilla ice cream, this rich, gooey chocolate cake is always a hit! This amazing chocolate cake starts with a cake mix and couldn't be easier or more decadent. In the bowl of a stand mixer, beat all ingredients (except chocolate chips) until well blended. Fold in chocolate chips. Spoon batter (it will be thick) into prepared pan. Cool for 15 minutes in the pan before turning out onto a wire rack to cool completely. Who Dished It Up First: I can’t even remember where I originally got this recipe, but I’ve been making it for years. OHMY ! This cake looks decadent ! I will have to subscribe to your feed. I am very interested in what you’re showing. Sounds great. Can’t find a cake mix that’s 18.25 size!!!! Wow I think I might have gained 5 pounds just looking at that picture! It looks amazing!! Sounds like a keeper, thanks! This cake is so good, I’ve made it before as well. Don’t you need to coat the chocolate chips in flour before adding them to the batter so they don’t sink to the bottom of the pan? amazing cake! I’ve made it 4 times and we love it! however when i click on the homemade fudge sauce it says i ‘This blog is open to invited readers only’ could you add me please! I’ve made this for years, but I add 1/3 cup of dark brown sugar to it. do you think I could substitute sour cream for plain greek yogurt?? I would think so Jill. If you give it a try, let me know how it turns out. I don’t think it would taste the same with the yogurt. The sour cream is delicious in it, and the brown sugar gives it an extra special yumm factor. When it cools, dust with powdered sugar! 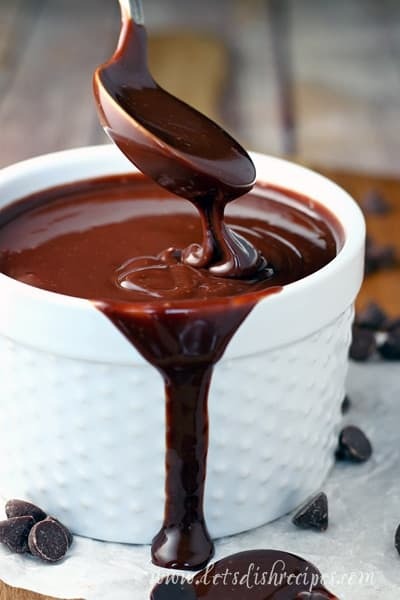 In a small saucepan, combine corn syrup and chocolate chips over medium-low heat. Stir occasionally until smooth, 4-5 minutes. Whisk in heavy cream until smooth and well blended. Serve warm, or cool to room temperature before transferring to an airtight container. Store any unused sauce in the refrigerator for up to 3 weeks. My nieces 10th birthday is coming up and she loves chocolate! Can’t wait to make this for her!!! She is going to love it! I’m just sorry I can’t have any…..
Can I use a regular 9×13 cake pan and frost it with regular frosting ? Now that cake mixes are 15 ozs. should there be any changes I should make for this recipe to come out okay. They don’t sell 18 oz. mixes anymore. Anyone tried it recently with the ‘new’ cake mixes? The recipe works with any of the new size cake mixes. Yes I just measure extra mix to get there. Making this for my son’s 40th birthday tomorrow. He wanted a chocolate cake and this fits the bill! It’s in the oven right now! Looks yummy and decadent. Thanks for the recipe! I’ve been making this cake for 40yrs, but I was recently asked if it could be made as cupcakes. What are your thoughts? I don’t see why not Pattie! Hi Danelle. I just love to bake when I have time to myself. that is ok with you. The chocolate cake sound wonderful to me. This is absolutely THE answer to a chocolate lovers cake. I follow your recipe and it turns out perfectly each time, a super moist, decadently delicious cake. Thank you so much for the recipe!!! This is my go to recipe for chocolate cake. I prefer dark chocolate but my kids like milk so I use a regular cake mix and dark chocolate pudding and we’re all happy with the final product. I’m going to start experimenting with chips next. When this cake is done will it still be loose and gooey or should I continue to bake until it passes the toothpick test? I went ahead and baked it several more minutes past the hour time given. I’m hoping I didn’t dry it out. Any insight will be appreciated. Thx! Laurie, it is a very moist cake, but I wouldn’t say it should be loose and gooey. It should definitely be firm when you pull it from the oven, with the edges pulling away from the sides of the pan. Because of the chocolate chips in it, you might not get it to pass the toothpick test perfectly, but I’d say when it looks firm and you can get a toothpick with a few crumbs attached, it’s good (you wouldn’t want what looks like batter on the toothpick though.) Depending on your oven, you may need to bake it a bit longer than stated for it to be done, so I think it should be fine. I don’t think another 10 or even 15 minutes would dry it out. I made this today. Not a big fan, sorry. I did use the hot fudge sauce, which was pretty good, but feel that the addition of the semi sweet chocolate chips was just too much. If I would make this again I would omit the chocolate chips – any maybe even the hot fudge sauce. Add vanilla ice cream if the chocolate is too much! OOOHHH MY GOSHHHH… I just made this bundt cake. Still a little bit warm but couldn’t wait to try it! It looks beautiful and tastes even better! Sooooo moist and chocolatey! I didn’t put the chocolate sauce on top because I am going to serve it with vanilla ice cream and chocolate topping. Delicious. Thanks for the recipe!! I plan to make this for my aunt’s birthday next week but I am going to bake it in 2 10in round pans. How long do you think it will take to bake? I would guess around 30 minutes. I absolutely love this recipe and have made it a few times now. Do you know – would this translate into cupcakes? If so what are your thoughts on bake time? Thanks in advance! Thanks Melissa! I don’t see why you couldn’t make cupcakes with it. I’d say bake for 23-25 minutes, but maybe a bit longer for these, since this recipe is on the moist/dense side. Today is my husband’s birthday and he LOVES chocolate! I found this recipe on Pinterest and thought it would be perfect. I don’t bake as much as I used to (mainly because if I bake it, I have to eat it) but for him, I will do this cake since it is so simple yet it looks amazing! I’ll have one slice and leave the rest to him. I have a weight loss goal I want to fulfill. Can you use a regular store frosting instead? 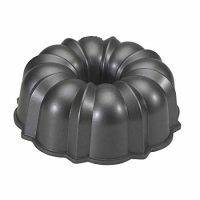 Melting in microwave and drizzling over bundt cake? I made this cake yesterday, and it was amazing! Thanks for the recipe! I will definitely be making it again. Danelle, I just put this cake in oven and it smells amazing. Can’t wait to try. I’m taking it to a fish fry tonight my friend is a chocoholic just like me. I’m thinking next time I might put some almond extract in it for a little cherry taste too. Thank you for such wonderful recipes. Have you ever made this with the cook & serve (5oz) chocolate pudding? Hubby bought the wrong one, seeing if I can make it work. Hey! A new recipe! My mom made a parfait cake dessert she called “Death by Chocolate” I will certainly give yours a try! Thanks for Sharing! I was just wondering. Do the mini chocolate chips melt into the cake or are they still whole & a little crunchy. Also, will they fall to the bottom of the Bundt pan & burn? I’ve had that happen to a cake in the past. They pretty much melt into the cake (no crunch) and do not sink to the bottom–the batter is pretty thick. If you used full size chocolate chips, you might still have some chunks though. This cake looks delicious and will be the next co-worker birthday cake! I do have a question. In reading the comments above someone questioned about the “mini” chocolate chips melting properly in the cake. Your recipe didn’t indicate to use mini chips. Does it matter? I mention the mini chips in the blog post, not the recipe itself, since that’s what i prefer to use. You can use whichever size you like! I was wanting to make this recipe into cupcakes…what do you think would be the best icing for these? 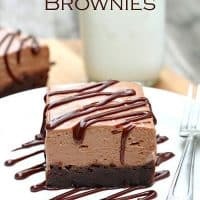 I have had them before without icing, and as delicious as they were, these are for kiddos, so I think they would want icing!! Lol!! I would use chocolate icing personally, but if you think that would be chocolate overload, vanilla would also be good. I live at high altittude. Do I need to add a tbls spoon of flour for this cake? I am at 5,000 feet, so unless you are much higher, I think you should be fine. I’m not sure what a good substitute would be. I would probably Google it and see what you come up with. I’d love to know how it turns out! I made this cake today, it was very very delicious. This recipe will definitely be used again and again. 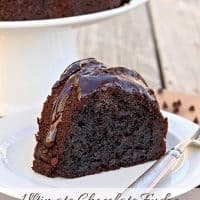 I’m looking for a chocolate mini bundt cake recipe. Do you think I could use this recipe in the mini bundt pans ? It should work fine. You’ll just have to shorten the cooking time. I’d say bake them somewhere from 20-30 minutes. It just depends on the size of your mini bundts. Seriously the best chocolate cake I have ever eaten. Everyone raves about it. A must make. I made this bundt cake and it “fell” like it was too rich. I didn’t underbake it. Is 2 cups sour cream too much with everything else? It was very dense but tasted OK. Just looked so much nicer before it took a big fall! I have no idea what it tastes like buy mine looks terrible!!!!! I am an avid baker so it’s not my first time baking a cake. OMG- I followed the recipe exactly and my cake is sunk in the middle, high on the edges and high in the centre. I’m SOOOOOOOOOO disappointed as I was to bring it to a birthday party this evening, now I’ll have to buy a cake. Can’t figure out what I should have done differently…will not try to make again. I’m so sorry your cake didn’t turn out Stephanie. As you can see by the comments, a lot of people have had it turn out, and I have been making it for years, so I’m not sure what could have gone wrong. Usually, when my cakes sink, it’s because I needed to bake them longer. The only other thing I can think of is that it could have been related to what type/size of cake mix you used. Or altitude, possibly? It’s always worked fine for me with the more recent, smaller cake mixes, but I know some people add a bit of extra flour to compensate for the difference in cake mix size. Absolute perfection! Making it for the second time in a week. Love how effortless it is and how wonderful it tastes! Thank you for sharing. Making this for Thanksgiving today, so excited to “wow” the new in-laws with my “baking skills” haha 🙂 Thanks for the recipe, I look forward to finally trying it! Warning: Dangerously addicting and delicious! Danaelle, The cake looks amazing. I am going to make it!! Can it be put in the freezer? I need to make it about 5 days ahead of eating it. I think I finally found the “Matilda cake”…remember, the kid that ate the whole chocolate cake in the movie? To me, that always looked like the ultimate chocolate cake, and I believe this is it! Made it for my inlaws anniversary last night and garnished with chocolate covered strawberries in the center and around the outside to make it super fancy. I also used Devils food cake mix since that’s what I had on hand. It was a HUGE hit! So moist and gooey! Everyone went back for seconds and took some home. I love baking, but I’ve never made a great chocolate cake. This one is so good that I don’t even care that it uses a shortcut mix!! Thanks so much for sharing! Do you follow what the box ingredients are as well. Or am I just added the cake mix? Or am I adding water and eggs and oil? You use the cake mix with the ingredients and directions in this recipe. Ignore the box. This cake is the best chocolate cake ever, precisely as written. Thank you for sharing and the chocolate sauce is “over the top” perfection. Oh, and one more thing, which is the best: You dump EVERYTHING in at once!! yay! This cake was awesome!!!! It is very dense. I used a bread knife to cut it. Instead of the chocolate sauce I put caramel syrup on it then covered it with chopped nuts. DELICIOUS !!! A huge hit with chocolate lovers. Do I add the pudding mix in as a powder or do I make the pudding first? My family thinks this is the best cake ever. My daughter-in-law is a registered dietitian and she loves it. My son is having a surprise party for her tomorrow for a special event in her life and he asked me to bring two of the cakes to serve to the guests after lunch. That is the ultimate compliment to you. She doesn’t care for many sweets but savors this one. Thank you for sharing. Can this be put in the fridge? I made it today (Friday) and am serving it on Sunday. should I leave it in the cake box? Refrigerating cakes can dry them out a bit, so I would leave it in the box. I saw an old post with someone asking if regular versus instant pudding is ok. There was no reply and I am facing same dilemma of a trip to store. 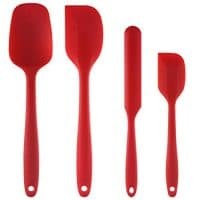 I have the cook and serve one. I honestly don’t know. I’ve never made it with anything but instant pudding. My guess would be to stick with the instant pudding, since it’s got different ingredients and cooking methods, but it’s hard to say for sure without trying it. This cake is amazing and has become a family favorite! Hello, what can i use instead of the chocolate chips if i want to make this a white cake? Do you think white chocolate chips would work? Do you suggest something else instead? I’ve never tried making it as a white cake. I think white chips would work, but honestly, I think I would just leave them out. OMG! The BEST chocolate cake ever! My husband wanted a “chocolate” chocolate cake for his birthday – like one we’ve had from a high end bakery or a 5 star restaurant. I found this recipe with a Pinterest search, and the ingredients list made it sound decadent – perfect! Cake mix sizes have changed a bit since the recipe was created – they no longer make 18.25 oz – and I had to buy a 15.25 oz mix….I looked for advice on the internet for help and was advised to add 5 Tablespoons of flour and 1/4 tsp baking powder (I didn’t see in the Comments until later that you could use the new smaller mixes with no alterations), and the cake was rose nicely and tasted great! Moist, dense but not too heavy, chocolate chips remained dispersed in the batter, and very chocolatey, but not too much so (is there even such a thing as too much chocolate?!). I even used the Chocolate Fudge Sauce recipe recommended, but I did alter that to sweeten (I doubled the corn syrup) as it was a definite bitter chocolate flavor. I saw in another comment that someone heated up jarred fudge topping – I bet that would be good, too! I’ve now gotten rid of all my other chocolate cake recipes as none of them beat this one! Thank you for sharing! I read with interest the comments of how “I changed this, or I added that…”. Well I made it exactly as stated, and I didn’t worry about the size of the box of cake mix. I didn’t frost it because I had to get it somewhere in a hurry. The cake was taken by my adult daughter to her place of employment. It lasted all of twenty minutes. The praise for this cake was 100% positive. Today I made the recipe into cupcakes to take to church tomorrow. Thank you for this recipe. It is now the only chocolate cake I will ever make. I followed your recipe to a T. Brought it out of the oven, looked gorgeous, set it on rack, and as it cooled, within a minute, it started to sink into itself, like a souffle. Once cooled, I flipped it onto serving plate and it held up nicely. Delicious flavor for a chocolate lover. Ganauch was thin and light brown, nothing like the picture.checked oven temp, time mixed,?????????? Usually when my cake falls like that, I needed to bake it longer. And I’m not sure what could have happened with the ganache. Hi. I made the chocolate cake – it turned out superb. Moist and light and delish. We liked it so much we decided we needed one for my father in-law’s 86th b-day. He likes lemon the best so we made it and it fell. I made another one as a do over and it fell. Why is this happening, any ideas? I literally just put this in the oven. It’s for dessert. I’m so excited. So easy too..that’s my favorite part!